It’s been awhile since we’ve seen Erykah Badu on the red carpet. But, she came back with quite the stylistically progressive vengeance at the 2018 Soul Train Awards on Saturday (November 17) in Las Vegas, Nevada. 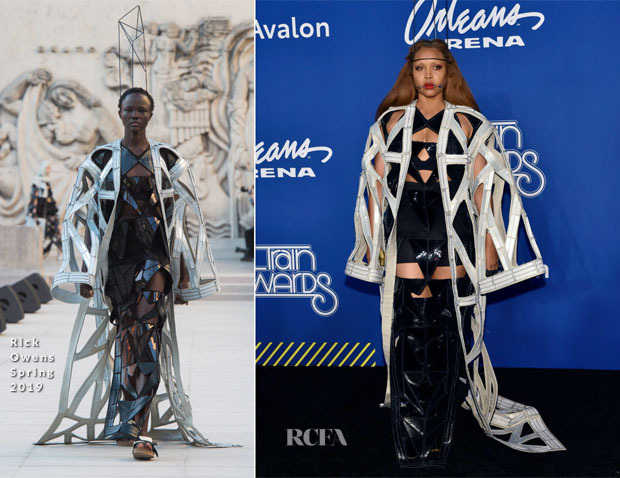 Although she later took to the stage to perform, the 2018 Legend Award winner started the performance early with this radical Rick Owens Spring 2019 ensemble that fully upheld the entertainer’s affection for all things over-the-top. There was something ever so stylistically sinister about this extravagant power look, where the laser-cut cage robe and metal scaffolding of the headpiece also took on a rebellious regal tone for the reigning Queen E.B. More than anything, it was a fascinating artistic statement — no matter which way you slice it.